Some people are just not comfortable with reading aloud. Their own voice seems too loud or soft or silly; they feel awkward, and wish somebody else would take over. It's bad enough feeling that way and reading to your own child. Imagine if you had to read to thirty or more kids! Sarah Mulhern, teacher and blogger at The Reading Zone, let me in on a few trade secrets. Sarah, you've been a language arts teacher for four years now. I guess you're pretty comfortable with reading aloud to kids, right? I love reading aloud to my students, and couldn't imagine not including it in my daily routine. But I haven't always been comfortable sharing a read-aloud with my students. So what changed the way you felt about it? Honestly, I was extremely lucky because I had an amazing mentor teacher when I was a student teacher. 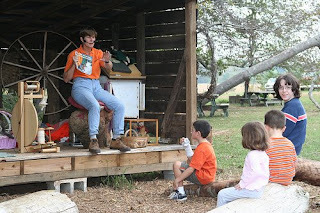 I watched as she read aloud to her students every day. I thought she was so brave for putting herself on the spot like that. Lucky for me, she kindly forced me into the spotlight, too. I began reading Stone Fox aloud to the class and it was the experience that started me on my path. SPOILER- Stone Fox is an extremely emotional book. When I first began reading it aloud, I was very self-conscious. I was afraid that my students could smell my fear, and would know how uncomfortable I was. Luckily for me, that all faded away when we got to the end of the book. Tears streaming down my face, I read the last pages to the class. As I looked out into the sea of tears that was my class, I no longer remembered being self- conscious. I was completely and totally focused on sharing the story. And that changed reading aloud for me. It was a magical experience. What did you learn from your mentor? What did she do when she read aloud that you adopted for your own read aloud skills? The greatest thing I learned from my mentor was the joy of reading aloud. Watching her make time for the read-aloud each day (and subsequently making me jump out of my comfort zone and read aloud) inspired me to do the same in my class. Thanks to her, reading aloud is an integral part of each day in my class. Your students are aged around twelve. I suppose most of them are independent readers. But you still read aloud to them? I try to read aloud to my students every day. Granted, we don't always have time, with assemblies and other interruptions. But they get angry if we don't read every single day! We read a lot of novels, mostly those I read and loved, and usually ones that have been published recently. This year we read Diamond Willow, Chains, The Underneath, and others. Right now we are reading Drums, Girls and Dangerous Pie. I love our read-alouds because it's a time for the entire class to come together and share an experience. We read at the end of the period in each class. It's a great way to unwind, build community, and share with each other. The kids love it! It's clear your students love the read-aloud time. But what do you think they gain from it academically? Reading aloud to kids helps them develop and improve all literacy skills - including reading, writing, speaking, and listening. And, according to Jim Trelease's wonderful book, The Read-Aloud Handbook, children listen on a higher level than they read, so listening to a read-aloud stimulates the growth and understanding of vocabulary and language patterns. Most importantly in my eyes, reading aloud models everything I want my students to get out of reading. I promote reading to my students at an age when recreational reading begins to fall by the wayside. It's like a constant advertisement for the pleasures of reading! Is it hard reading to these older kids? I mean, lots of people seem to think we should stop reading to kids when they can read by themselves. At the beginning of the year they sometimes balk at the idea, because no one has read aloud to them in years. But within the first week they love it! I usually start the year with Ralph Fletcher's Flying Solo and it really hooks them. And I book talk all year long, so when I choose to read aloud a title I book talked, they are thrilled. Please explain what you do in a "book talk". A book talk is really just an advertisement for a book - a commercial of sorts. I tell my students about books that I have read - I try to attract them to the books. Books aren't like movies - there aren't a lot of trailers or previews out there. I have to hand-sell most books to my classes. My passion and excitement can really make a book fly off the shelves in my classroom! What tips do you have for people who would love to start reading aloud but lack the confidence? In the beginning, I definitely lacked confidence. I thought I would sound silly and the kids would be bored. But I learned by watching and listening to my mentor teacher. Once I broke down the wall I had been fighting to climb over, I was fine. My advice is to just do it. Your kids will love it, no matter how you think you sound! And practice develops confidence. Choose a book you have read and loved, because your passion will come through in your reading. If you had to pick your all-time favourite read-aloud book, what would it be? Oh, I can't! Too many to choose from! I love different books for different reasons, which is why I switch up the books every year. I read Flying Solo and Drums, Girls and Dangerous Pie every year for specific reasons. The other novels I choose as I read current books published that year. This year, I loved the Underneath. Reading it aloud was an unforgettable experience with my students. Do you have a favourite read-aloud book? Share it with us in the comments. I'll be choosing one commenter at random to receive a copy of the beautiful picture book, Hush, Little Dragon by Boni Ashburn and illustrated by Kelly Murphy (Abrams Books for Young Readers, 2008). Check out the Share a Story blog for a glimpse of this and other books generously donated to our Blog Literacy Tour. WON!!!! by Kristi @Chase-ing Dreams. Congratulations Kristi, and thanks again to Boni Ashburn!